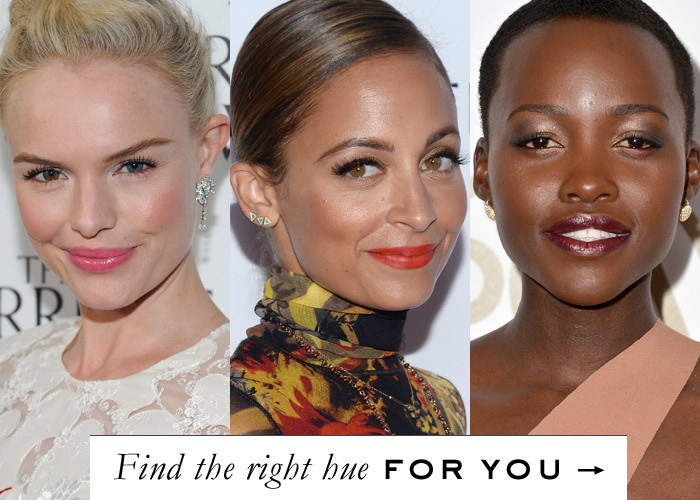 It can be a challenge for the best dressed women to find the best lipstick color based on their skin tones. How do celebrities do it with such ease? Guess what, they have make up artists who help them out constantly. Here’s what we learned when we talked to a local make up artist about lipstick shades based upon skin tones. Reds are one of the most challenging lipstick shades to choose from. While red is currently the hot lipstick color, many find that it is one of the most challenging to choose from. Red lipstick comes in a wide array of shades and they are all based on different base colors. Reds come in bases of blues, oranges and true reds which is why one red may look great on your best friend, and horrible on you. If you have tones of yellow in your skin you will find that the blue undertones work best for you. An orange undertone will make you look even more yellow and you’ll be asked if you’re feeling okay. True reds work on every skin tone but can be a challenge to find as well. If you have an average toned complexion you may well be able to choose from any of the undertones in the red shades. Many will be envious of your for this ability. Brick red colors have undertones of browns in them and tend to work well on most skin tones. Beware the lighter shades if you have undertones of yellow in your skin though, they can make you look washed out and faded. Stick to the darker brick reds and you should be fine. For a rosy glow you may wish to consider a coat of lip gloss on top of your brick red shades. Many find that choosing a red lip gloss is plenty of red for their skin tones. Red can appear brighter on lips than first anticipated so when first using go sparingly to avoid overwhelming your lips. Many women with golden skin undertones find that an orange undertone on a red lipstick looks fine on them. A lot of choosing from the reds is trial and error. Consider applying a brick red lipstick and a red lip gloss for a unique one of a kind look. Purples are in much the same category as red lipsticks are. Check your undertones. Purples can vary from company to company. A plumb color is generally darker and violet will be more of a reddish purple. Pale sallow skin tones will need a less intense shade of purple. If you’re blessed with ivory skin, you’ll probably look very pale and anemic in coral lipsticks. You’ll want to choose a version that has more of a rose colored coral tint to avoid looking washed out or sick. It’s also important to make sure your teeth are very white when using coral colors. Corals can lend a yellowish look to teeth so you’ll want to have your teeth looking their whitest before attempting corals. If you’re blessed with a head of gorgeous red hair count yourself lucky. However, you may also have very fair skin. Stick to the truest reds or reds with blue undertones to avoid a washed out or sickly look. Also avoid corals as they will make you look more of an orange than red. Congratulations. Your darker complexion works well with most shades of lipstick. It shows that assignment-helpers.com the whole sentence can be proclamation.. Your skin tone lends itself to most reds, corals and pinks. You may wish to brighten up darker skin with brighter tones of reds and pinks. Find a signature color that looks great with most of your wardrobe and you’re set for any event. If you have extremely pale skin you may do well with pinks and pinkish corals. You may have yellowish undertones or bluish undertones so you’ll want to select your lip color accordingly. As stated above, yellowish skin tones should avoid orange undertones in lipsticks. Many prefer to choose their lip shades on matte or glossy colors. Every color is made in matte or glossy selections so it’s an entirely personal preference. You may even wish to switch back and forth depending upon what you’re going to be doing. A great way to pick and choose your lipstick colors is to get to know your local cosmetics counter girl. High end department stores have a highly trained person at the cosmetics counter. Get to know them. They can recommend an ideal color based upon your complexion, skin tones and favorite colors. They also have samples which you can take home and try out in various situations. Your skin will take on different hues in different lighting situations so this is an important aspect when selecting your signature color of lipstick. Ask her opinion and don’t be afraid to hear “that doesn’t suit you”. She will know what does and help you locate it. Many top models swear by a quality name brand color for consistency and wear. You may not wish to pay quite so much for your lipstick but every brand has a few good quality lipsticks from which to choose. After you’ve selected a few shades of lipstick to try, get a few opinions. Ask the sales girl at the cosmetics counter. Ask your boyfriend or husband. Test them out in various lighting venues to see how your lips look in bright light, soft light or dusk. Let them be honest and you’ll find that when you find the perfect color, you’ll know it. Don’t forget to remove your lipstick before hitting the bed otherwise it can cause damage in the long run, a beauty tip from Dr. George Marcells!. Many cosmetic companies use lead and other chemicals to prepare products such as lipstick . If left on overnight, this is harmful for the lips. Remove lipstick by gently dab the lips with a dampened soft cloth or paper towel. Choosing your lipstick can seem a daunting task at first but if you truly want to wear it you’ll find the best colors by trial and error. Consider your skin tones and the underlying tones of lipstick shades to best compliment your complexion and then go for it. Visit Beauty Salons To Look, Feel And Be Beautiful Always!